More often than not, our lives don’t turn out the way that we envision. Whether for good or bad, things change. They always do, one way another, if we continue to do so. Some people are happy with things as they are; others always dream of more and want to be inspired or find something to be excited about to awaken their creativity. Some people play in a band, join a hockey or bowling league, or any other number of hobbies outside of their work life or daily exchanges. It is important to find something that awakens our brain cells and engages us in enthusiasm. There are so many artistic outlets that people have like photography, painting, crafting, renovating….. any number of DIY projects that add a spark to the daily necessities and business of life. For me, I find wonder in things that others may deem mundane or without merit. However, I need to find things that use my passions and bring satisfaction at seeing what I have brought forth. To bring peace and pleasure to the mundane, looking for things that can bring us to wonder and happiness, even for a short time, allow us to dream more creatively and fill our spirits with Hope. Thank you so much for stopping by. I do hope that you enjoy your visit. The focus is the soaring height of the historical architecture and while there are crowds of people, deep in their individual prayers, they are connected in their faith and focus on the Western Wall of the 2nd temple in Jerusalem. The second temple was finished in 516 BC and stands as a testament to religious freedom and survival for over 2,500 years. From excavations in the Jewish Quarter, walkways and columns, as well as stalls and other evidence of daily life, were discovered dating back to the 6th century AD. The “Cardo” was the main street in ancient Roman cities. The Cardo still stands as a piece of history where people can see what architecture and life was like historically. The history and ancient buildings draw in the eye as people walk by on cobblestones thousands of years old. Jerusalem stands as the home and birthplace for three religions. It welcomes all pilgrims and those who seek to appreciate its beauty and historical significance. Rosh HaNikra is located at the northern most tip of Israel, and the Lebanon border, where the land meets the vast Mediterranean Sea. Time, rain, minerals in the earth and rock, sunlight and heat, and the steady flow of the Mediterranean Sea against rocks and cliffs have turned this natural environment into a place of beauty and peace. Over 3,500 years of nature’s literally “going with the flow” has produced exquisite grottoes. It was 74 degrees F (appx 25 degrees C) in the middle of December. As it was below zero back in North America, it was literally a day at the beach and a time to linger and ponder the wonder of creation. While speaking to another person about my cooking and baking experiences, I realized that I had acquired more than just skills along the way, but had also developed tried-and-true tips. This got me thinking about the many opportunities that I have had to learn along the way. However, today’s prompt gave me a way to share some of those ideas. When cleaning mushrooms, place in a shallow bowl and sprinkle flour over the surface of them. Let them sit for a few minutes. Then, wash the surface of the mushroom gently with either your fingertips (if you prefer more tactile cooking) or a very soft baby toothbrush. The flour gives the dirt something to grab onto and helps to rinse away more of it before using in soups or salads. To measure thick liquid items, like syrup or honey, lightly grease a dry measuring cup (the kind you would use for flour or sugar). You can use a light spray of a vegetable coating product like Pam. Or, if you don’t want to use an aerosol or prefer less chemicals, lightly coat a folded paper towel with canola oil and wipe along the inside of the measuring cup. This will keep the tacky substance from sticking to the measuring cup and will pour easily into your mixing bowl. Many recipes call for vegetable shortening or butter and state specific measurements. 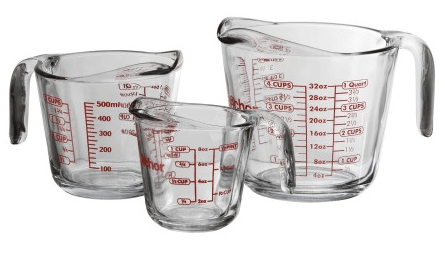 To get a most accurate measurement, rather than spooning tablespoons into a dry measuring cup and mashing to fill it, an easy way to get the right amount is by using a large glass measuring cup and water. If your recipe calls for one cup of butter, you can use a 2-cup or 4-cup measuring glass (Pyrex and Anchor Hocking make great ones). Use a clear glass liquid measuring cup so you can easily see the line markings. If you are using a 2-cup liquid measure, place one cup of cool or room temperature water into the measuring glass. If the water is warm or hot, it will begin to melt the shortening. As you spoon your butter into the measuring glass, the water level on the markings will begin to rise. When the water level rises from the one-cup measure line to the two-cup measuring line, the amount of solid used is the equivalent of one cup. This easy mini science lesson is called “solid displacement.” If baking with children, it is a great teaching moment. Pour off the water carefully and tip your chunks of butter into a mixing bowl. What great ideas have you learned and incorporated along the way when you create something special in your kitchen? Thank you for stopping by. I hope that you enjoy your visit. You are most welcome here.